I do not usually visit style.com. In fact, this is probably my second visit to the site. This time round something is distinctly different. I was glued to the site for hours as retro chic has become the buzzword for Resort 2011! I saw lots of beautiful sheer fabric, scallop edges, soft ruffles and irresistible laces. Thereafter, I went in search of similar vintage sewing patterns for them. I didn’t manage to locate all of them but will update the list whenever I do make new discoveries. Please feel free to let me know if you spot something similar! Kaftan by Chanel and 1970s Simplicity sewing pattern available at RetroModVintage. Or check out the instructions here. Dress with scallop facing by Christian Dior and 1971 vintage Simplicity dress with Peter Pan collar available at OneLittleWindow. Scallop facing can be made using the Vain and Vapid tutorial. Flower belt tutorial at Ruffles & Stuff. Dress with scallop neckline by Marc Jacob and 1960s vintage Simplicity sewing pattern available at mbchills. Or if you have the Built by Wendy Dresses book, this might work. Use the shift dress pattern, shorten the sleeves and hem. Draft your own neckline and facing pieces for the neckline, sleeves and hem. The styles were minimalist, mod, preppy with a good variation of wrap and shirt dress and bow blouses. The popular hues ranged from black, grey, white, green, purple, blue, orange, red and pink. Mostly in solid pastels. Pink Dress with white facing by Louis Vuitton and 1970s Simplicity vintage sewing pattern available at frillygirlythings. 2 piece outfit by Marc Jacob and 1966 vintage Simplicity sewing pattern available at vintagesewingandmore . The popular prints with designers this season include black and white prints, animal prints, nautical stripes and florals. Floral Mod Inspired dress by Stella McCartney and 1960s Mod dress sewing pattern available at SewingWithMissDandy. I am glad to have spent the time browsing through the many Resort 2011 collections. Most importantly, I saw gorgeous retro inspired designs brought to life in a big way by numerous designers. The experimentations with adaptation, new fabrics, colours and embellishments are just fabulous! Some of us might just own vintage sewing pattern similar to the designers’ creations above! 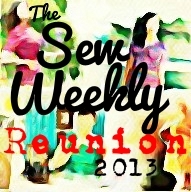 Now, I can’t wait to get back to sewing retro inspired garments! If you have been procrastinating on a vintage sewing project, perhaps this will be a great time to start. Do you have a favorite from the outfits above? It’s too difficult for me to pick one. I am torn between Marc Jacob’s scallop neckline dress, Giambattista Valli’s little black dress and Chanel’s kaftan. Oh! And if you have time, go check out the Louis Vuitton Fall 2010 Campaign shots! I love LV dress very much. simple and very feminine. I’ll keep this photo on my next sewing wish project!! You, my friend, have very good taste. I adore how you matched up retro patterns with current trends. You have a gift! I love all this RETRO HOMEWORK you’ve done for the rest of us. Thank you! joined your feed and stay up for seeking extra of your wonderful post.